We've received a lot of feedback in 2017 and heard rumors of backprint shutting down their service. In response we've released our new features to significantly improved replacement for all photographers in need of a website to sort and sell their photography. In our previous blog post we detailed our new photographer plans and changes to our services in 2018. We'd to break down those new features and explain how they can be used to bring your photography to the next level. 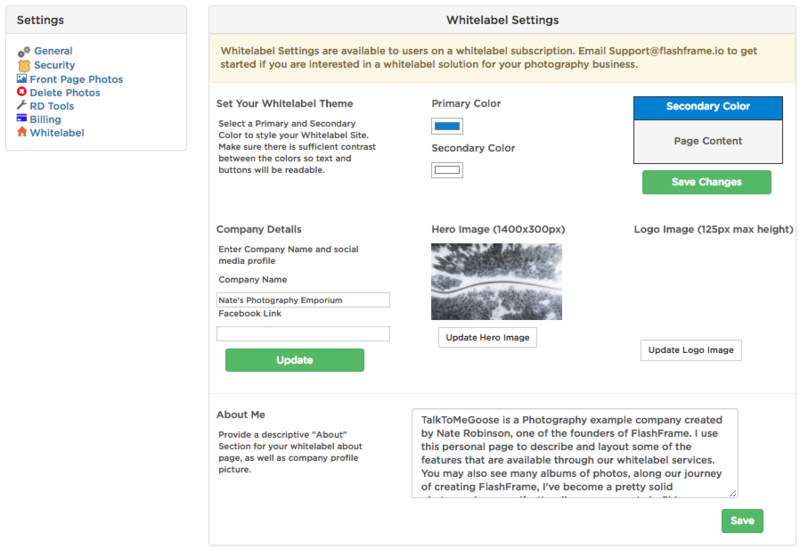 Signing up for a whitelabel subscription you’ll have your own personalized storefront, which you can customize with colors and images. We aimed to keep FlashFrame’s clean simple feel while making it easy to show off your strongest assets, the images themselves. Your company title, logo, hero image, color scheme, as well as an informational about your company and profile image can all be adjusted from your home and settings page. All albums you have contributed will automatically show up on your home page and you’ll have the ability to change the cover-image of each of the albums. On clicking into the albums user will be able to follow the entire path of searching, selecting and purchasing photos without ever leaving your branded site. Photos will be delivered to customers with the same custom branding and will have the same purchase options as on the main FlashFrame site. In addition to an external storefront whitelabel, photographers on the subscription package will have access to other important tools necessary for best marketing their work. After uploading images you can run a bib-relate function. 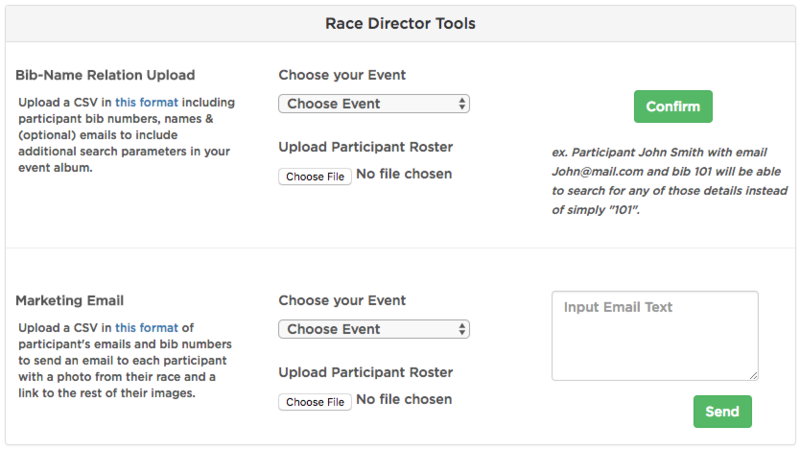 By uploading a csv with the names and bib numbers of your runners you can allow them to search by other categories. Email marketing is a pivotal tool for photographers to generate interest in their images. After all of your images are uploaded and tagged you can upload a csv file with the names emails and bib numbers of all participants at the event. After typing in a custom message you will automatically send each of them an email with a watermarked thumbnail dropped into the email and a link to the rest of their images. Your personal site branding and message will be included with every email. In addition to searching by bib number we aim to create alternative ways for customers to find their images. When you upload images you can specify a location for each set of uploads, this allows your customers to search for photos by location. Additionally be sure to set your clock on your camera to local time before shooting so that customers can take advantage of time search. They can now filter to photos only taken within a specified time range. Users can input the exact time they crossed the finish line and the location to filter to only their photos if they forgot to wear a bib number or can’t find them through typical bib searching tools. The time filtering tool is a very new addition and will only be available on albums created starting January 2018. We are still supporting our color search which allows users to filter to only images that contain people with specific shirt colors. This can be helpful at events with difficult to identify bibs or events that don’t use typical bibs. We hope everyone is able to take advantage of the new features and continues to enjoy the platform. Make sure to keep checking in on the blog for feature updates to the whitelabel beta as we continue into 2018.